Happy Happy Tuesday!!! It's the first week of November!! Have you had any snow where you are?? We had a few flurries this past weekend, but nothing that stuck to the ground yet. 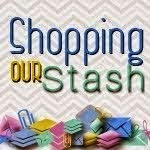 Are you ready for a new SHOPPING OUR STASH challenge?? This week the crew would like you to "Leaf Me Alone" and by that we mean we'd like you to use leaves - images, paper, real, silk, or whatever on your project. You can check out all the challenge details on the SHOPPING OUR STASH BLOG and while you are there show my crewmates some crafty lovin'!! Want to play along with the SOS crew?? Link your project to the SOS BLOG by 11:55 pm EST on Monday November 10th. SO pretty and Fall-y. Love that BINGO card! Super card, I have some bingo cards didn't know what to do with them. Your card is fabulous. holy crap, you beat us to the snow! We were supposed to get some Sunday/Monday but nope. And today it's supposed to be +17. WTF? I love this layout - and the woodgrain - and that fab corrugated leaf!! Love this card Donna! 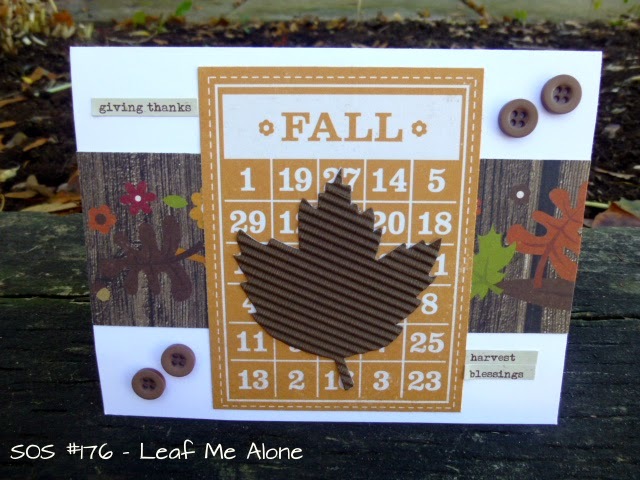 That fabulous woodgrain paper, the corrugated leaf, the Bingo card! Awesome! Awesome design :) love the leafy panel !